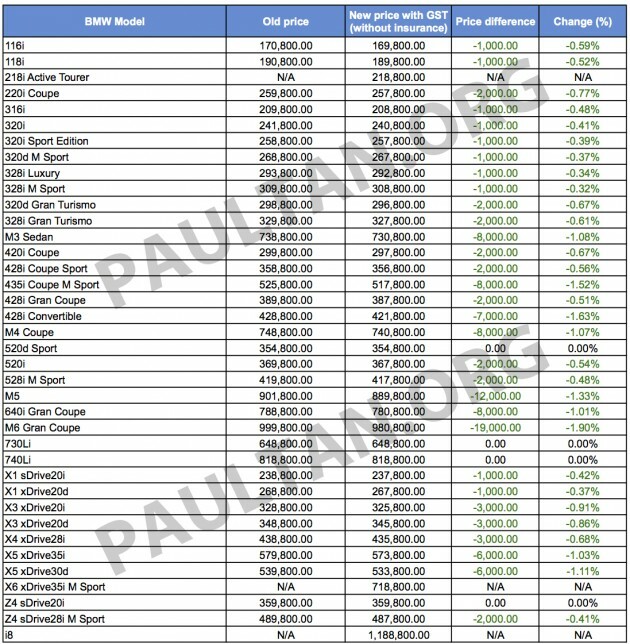 BMW Malaysia has finally released its post-GST price list for all its models and on the whole, it’s a pretty rosy picture indeed. The majority of the range will witness a reduction in price bar the BMW 520d Sport, 730Li, 740Li and Z4 sDrive20i – the 218i Active Tourer, X6 xDrive35i M Sport and i8 are not affected, having been launched after the implementation of the Goods and Services Tax (GST). 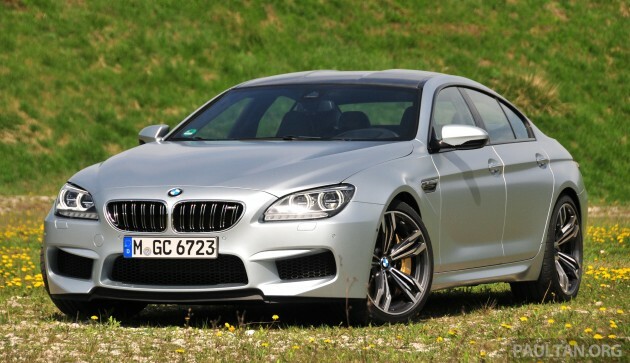 The most significant drop in price comes courtesy of the revised price tag adorning the BMW M6 Gran Coupe – a massive reduction of RM19,000 (1.9%) now sees it priced at RM980,800 on-the-road (OTR) without insurance. On the other end of the scale, one has to now fork out less than RM170k to own a BMW as the 116i’s price tag has been reduced by RM1,000 to RM169,800 OTR sans insurance. For M fanatics, the BMW M5 now sees a price reduction of RM12,000 while both the M4 and M3 are now cheaper by RM8,000. Prices are now quoted at RM889,800, RM740,000 and RM730,8000 OTR without insurance, respectively. Why do I get a sense that this was a knee-jerk reaction to the industry? BMW did look like they messed up a bit when they were one of the few who didn’t drop the price. Also, for those who did buy between 1st and 16 April, what happens? I think this updated price list was made in response to the backlash BMW Malaysia got earlier on after seeing MBM & Audi Malaysia lowering their prices. PS: X3/X5 price now looks a bit better. But I think its a bit misleading to say that one can own a brand new Beemer under RM170k now when the price does not include insurance (+6% GST) and road tax! fantastic. been waiting for this! Even if they reduce 50k per model it’s still much expensive than other countries!!!!! I hope one day you will be in the game. BMW was the first to announce no reduction in price post GSM. Then the rest started to announce price reductions. Must not be seen as arrogant and profiteering it had to do likewise. 3 cheers for free market competition. So ahmad maslan and the kastam head were right. Come gst vehicle prices go down. The car prices go down. Its a fact. Thats why i am different than u lot. I wasnt crying for cheaper cars. I want affordable cars. The 19k reduction – it is a reduced price – but it isnt what i can afford. Lesson 1 : get your argument right. When even UITM bash ahmad maslan, u have reached epic level of bodoh. so far i havent seen a car with price decrease up to 3~4%. The big liar has become a pathological liar. No one listens to him anymore. Most people are cursing him day and night. Serves him right. BMW 3 series 116i 136hp only kosong features… RM200k..
for ppl who want the BMW Logo, C-segment. but u will not get the BMW good noise insulation, too much of cost cutting..
320i US only RM120k, Malaysia RM240k. 2 years manufacturer warranty only for this…. nice. Your money seemed to be hard-earned. Some people have 316i as their lousiet car at homes to be used by saudara-mara. Will you lend other people your X6 or 7-series? Car lover may have a few luxurious vehicles at home but he will only lend out the only cheap one; the favourite one cannot even be driven by wife. Please explain what’s your point actually? whoaaaaa! so cheap! thank you DS Najis!!!! You da man! Do you have the price update for BMW Motorrad? From the news, the cost reduction is up to 18%. from this 18 ringgit spent. should be ashame of yourself ! !